I am a few weeks early on this one, but I can’t resist. As soon as I saw the theme for this month’s Sugar High Friday (SHF), Sugar Art, I knew that I would make Mom’s Peanut Brittle. This is the sugar art that I grew up with—a crackly, buttery brittle loaded with peanuts that crunches nicely in your mouth without breaking your teeth. It’s a Christmas tradition for my family. 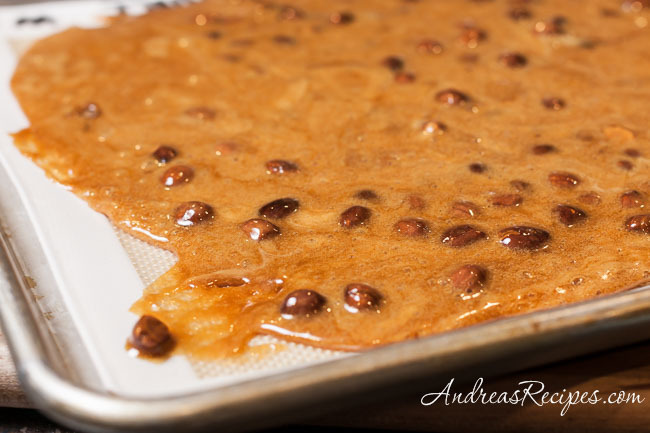 Making peanut brittle is fun and relatively easy, you just have to watch the temperatures closely and work very quickly when you pour the hot liquid out onto the cookie sheet. If possible, have another person help you hold the pot and pour while you spread the brittle around. Update: Check out the roundup of gorgeous sugar art at Habeas Brûlée. Combine sugar, syrup and water in heavy pan. Stir over medium heat, cooking until the sugar dissolves. Cover and cook 3 minutes. Remove cover and cook to soft ball stage (234° F). Remove from heat and add the salt, baking soda, vanilla, and butter. Stir until well blended. Spread onto a well buttered cookie sheet, working fast. If you want very thin candy, loosen the edges and stretch as thin as possible before it cools. Break into pieces and store in an airtight container. 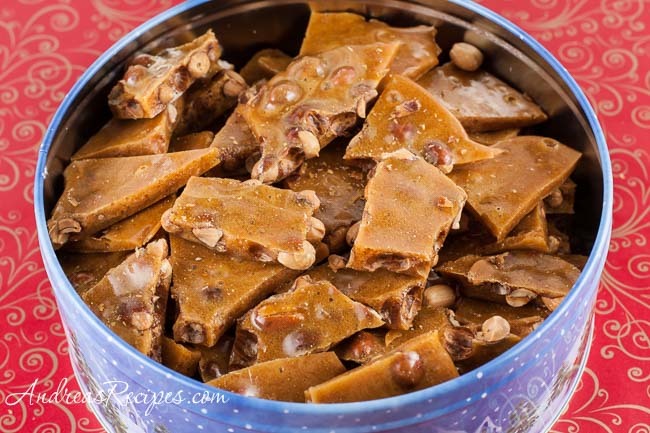 how can I avoid STICKY peanut brittle? also my last batch was light in color instead of a golden color. I let the temp go as high as 340F. was that the reason for it being sticky and light in color? Hi Sandy! 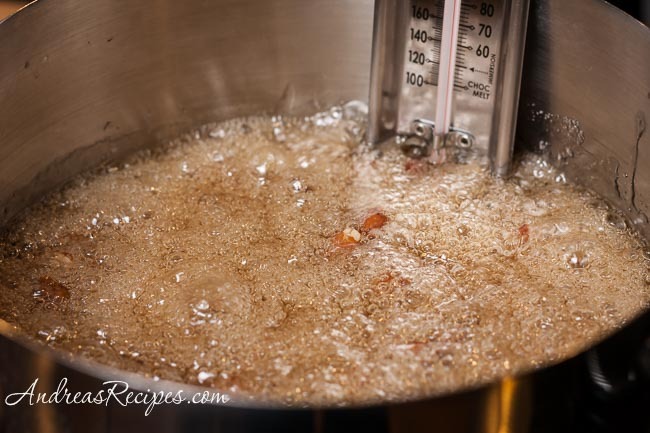 The sugar should caramelize during step 2 of cooking, as that is what gives the rich, golden color. Cooking the brittle higher than 300 F can cause the sugars to become weak and spongy (sticky). High humidity (above 60%) can also make peanut brittle sticky.